I really enjoyed this blog post from anthrozoologist N.S. Rose, about the endangered Suffolk Punch. Here’s a review of one of my favourite books about working horses, written for the Equine History Collective. This splendid account of the lives of working horses in and around the city of Manchester at its 19th century zenith, when it was the “workshop of the world”, home to the greatest manufactories in Britain, is one of my favorite books. Wearing borrowed Wellingtons and hard hats, our group is sloshing along in single file up a narrow channel down which a stream is flowing. The water is quite deep in places and the only lighting comes from the round metal torches we carry, which are powered by battery packs slung at hip level. Every now and then there’s a “clunk” as someone’s helmet hits a low section of roof. 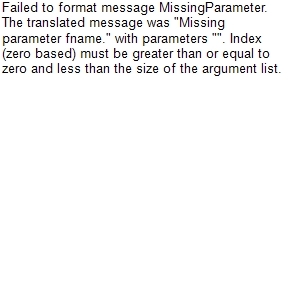 Our guide reminds us that he did say that would happen. “But just look at the construction of the tunnel,” he enthuses, quite rightly. Torch beams flash up onto the roof. It’s a remarkable feat of drystone engineering which leads right into the heart of the mine at Killhope, Co. Durham, which is hosting an event in celebration of the ponies – the famed galloways – who worked in the lead industry in Weardale, Britain’s biggest lead mining area in the 19th century. We are wading in the steps of the equines who worked underground in the Park Level Mine. This tunnel and its donkey-shoe-shaped entrance were designed with ponies in mind – and that’s why even the smallest adult amongst us – that would probably be me, then – frequently has to duck even lower. The entrance to the mine bearing a fitting resemblance to a horse, or possibly donkey, shoe. As we entered the door, a phrase from Tolkien ran through my mind – “in Moria, in Khazad-dum”. After walking up the tunnel for what seems like an age, this is replaced by “where Alph, the sacred river ran, through caverns measureless to man, down to a sunless sea…” It’s definitely more Khazad-dum than Kublai Khan, though, and this is giving our group a vivid impression of what it must have been like for the ponies, men and lads who were employed in the industry, starting at 4d. a day for the youngest. That’s fourpence in pre-decimal currency, or approximately 2 pence at today’s rates – slightly less, in fact. Dales pony Westwick Paddy and Kevin Owens at the entrance to the mine. The galloways, it transpires, were better off in terms of working conditions than the men. The miners wore only wooden clogs and felt hats; the galloways had leather boots to protect their feet from the flow in wet levels and leather blankets to save their backs from the drip, drip of acidic water from the roofs of the tunnels. An average day’s work down the mine would involve 15 turns – that is, trips in and out to fetch the distinctively narrow tubs for carrying out the ore, possibly up to three at a time. Each pony would usually perform two to five of those turns. The underground roads set with rails for the tubs were originally levels through which water flowed freely. They were later called the horse levels, the areas to which the horses and tubs had access, rumbling along rails that were at first made of oak but latterly of iron. The miners worked away in side tunnels, often above the heads of the galloways, for in the Killhope mine the lead ore was frequently extracted by working upwards, rather than downwards or horizontally along the seams. Unlike the ponies who worked in the later deep shaft coal mines, galloways involved in the lead industry lived above ground and the stables they used can be seen at Killhope along with the blacksmith’s shop that provided a range of vital tools and services to the mine. 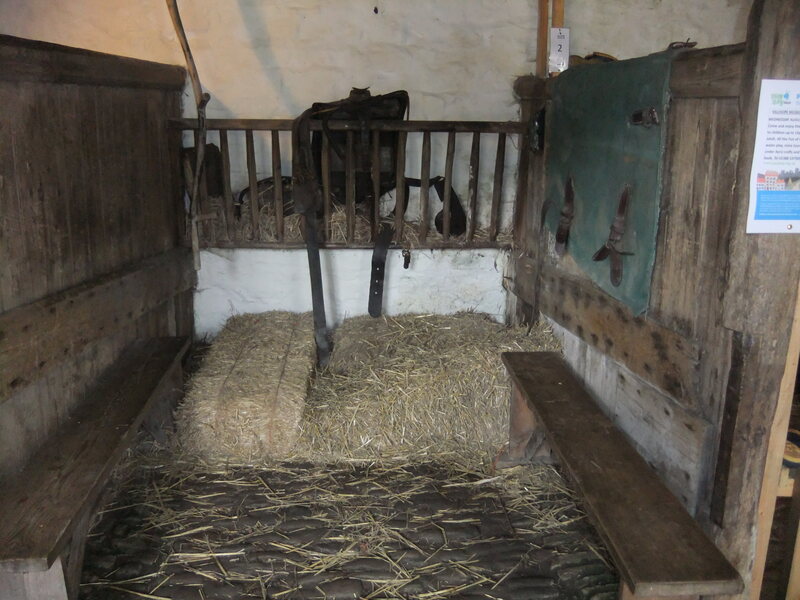 Local tenancy agreements included the provision of ponies and the majority of them were provided by farmers from further down the dale, along with supplying their own labour in the mine. The activity of both men and galloways was controlled by the famous local merchant family, the Blacketts, who later became the Beaumonts. Tenant farmers were limited as to how many animals they could keep – so many sheep or so many cows, or an even more limited number of galloways – this was called the stint. 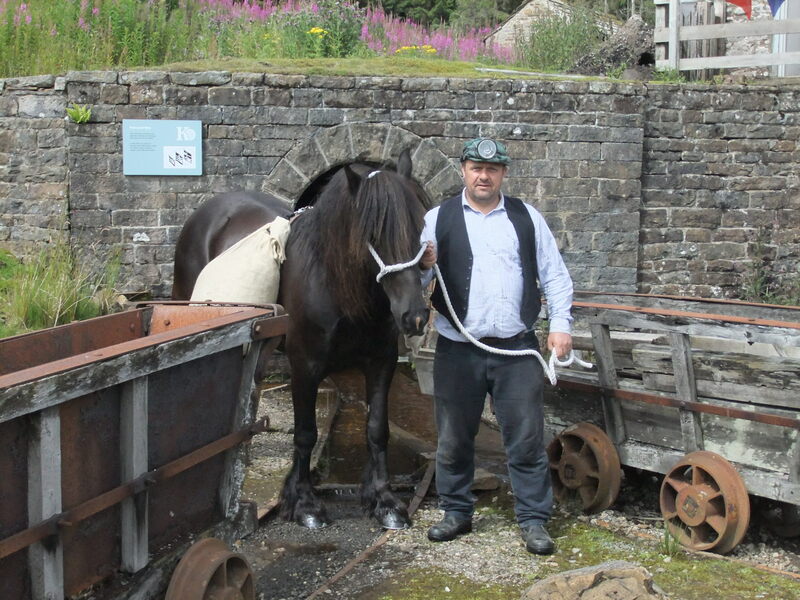 Ponies were capable of providing useful labour for the lead mines and so they were valuable and valued. Charlie Parker of the Roandale Dales Pony Stud with Roandale Rock (Rocky). The pack galloways, loaded up with 2 cwt (hundredweight) of ore each (that’s 101 kg), were not led but picked their own way across the tops. They wore muzzles to stop them grazing along the way – a standard with all pack horses, for the trains could be twenty to thirty strong with just one or two men to accompany them. If the horses or ponies were stopping too frequently to graze, shipments and deliveries would never be made on time. However, the lead mining ponies’ muzzles had a more important function in preventing them from eating grass contaminated by lead. There were other hazards, too. More than one galloway ended in the mire as a result of wandering too far from safe tracks en route to the smelters. The tracks across the fells went by various names: the Carriers’ Way, the Black Way and the Broad Way. Later, as road improvements meant that more efficient transportion of the lead in horse-drawn loads was possible, the first roads in the area were all determined by the lead industry. Finally, chugging their way up the valley a little too late to save the declining lead mines, came the railway’s iron horses linking Newcastle-upon-Tyne with Hexham – and beyond. “The packhorses…were kept by the farmers in the neighbourhood, often to the number of twenty or thirty. Mules were also sometimes used. The animals were provided with a sort of angular wooden saddle, which had raised pieces of wood affixed, back and front, with holes in them, through which chains were passed, in order to secure the timber when it was being carried to the mines. They also wore leathern muzzles to prevent them from stopping to crop the herbage by the wayside. The driver of the string of “galloways” frequently bestrode a donkey, kept for that purpose. The same Galloway always led the way, and was called the raker.” G. Dickinson, “Allendale and Whitfield”, 1884. Lead mining transformed the landscape and in its early stages it was an industry as dependent on horses as on manpower. 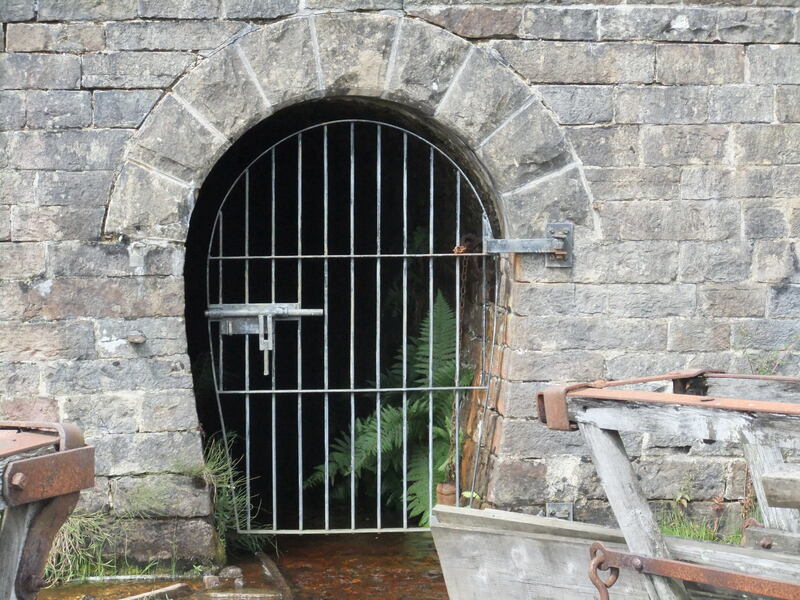 Water, too, which was diverted from the tops of hills right along the dale and channelled into a series of reservoirs to provide energy for the mighty waterwheel at Killhope. Occasionally dams were deliberately breached to create a rush of water that would create a “hush” – a man-made valley within which the lead ore was exposed and accessible. Lead was one of the most useful commodities of the time and it is still a requirement in many industries today, most notably the production of lead batteries. 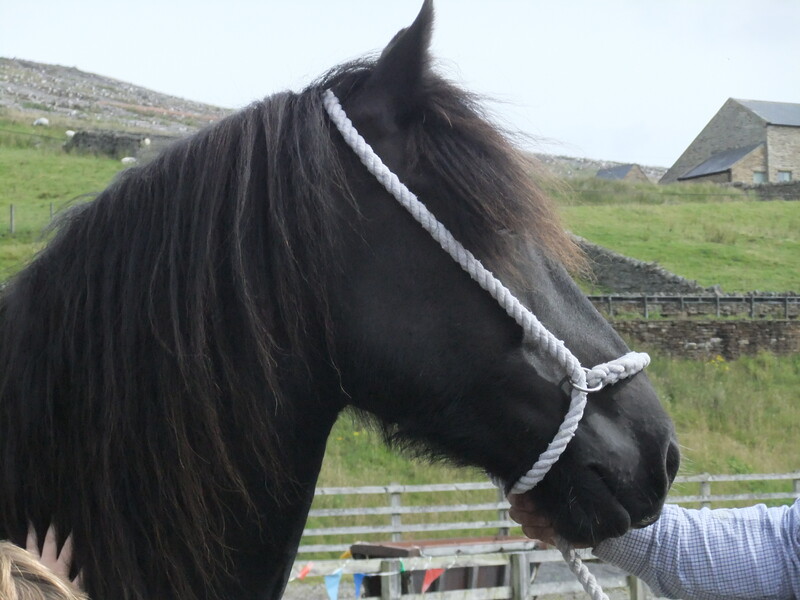 Dales pony Westwick Paddy, whose galloway ancestors may well have worked at Park Level Mine, Killhope. During the 1840s, when lead extraction in Weardale was at its peak, there were perhaps 1500 galloways involved in the different stages of the industry. Although not called Dales ponies at this point, they were indeed the ponies of the dales of north east England: Tynedale, Weardale, Teesdale, Allendale and also the neighbouring eastern dales of Westmorland and those of the West Riding of Yorkshire. Teasing out the differences between the Fell ponies of Cumberland and Westmorland – now Cumbria – and the Dales ponies at around the time of the establishment of the first stud book in 1898 was difficult. 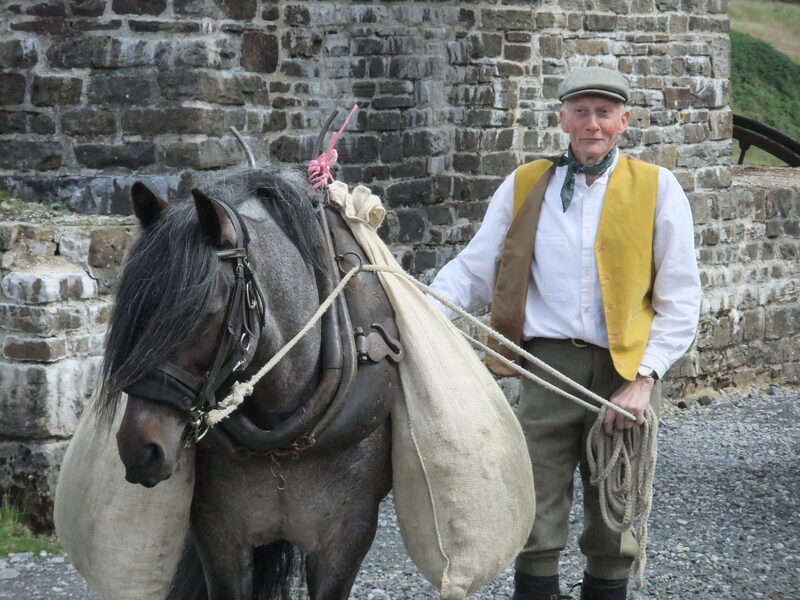 It was only with the establishment of a separate Dales pony stud book in 1916 – the event that is being celebrated at Killhope today – that the recognition of a particular type relating to the remote upland areas of the region came about. 1861. April 27. Died at Cleugh Head, Mary Stobbart, aged 64 years. She had for many years travelled the roads with her two horses and carts, carrying ore from the lead mines to Allen smelt mill, and lead from the mill to Haydon Bridge, and doing all the work of an ordinary cartman. When on one of her journeys to Haydon Bridge, one of her horses ran away while she sat on the limbers, from which she unfortunately fell, the cart passing over her, and she received injuries which resulted in her death shortly afterwards. – G. Dickinson, “Allendale and Whitfield”, 1884. It’s worth pointing out that whilst standardisation of many breeds and the establishment of stud books took place in the 19th century and early 20th, there was – and still is – room for differing types within each breed, which is necessary if breeds are to survive and flourish. Like many other famed northern breeds of horse – the Cleveland Bay comes to mind – Dales ponies were bred with a purpose and that purpose was similar in both cases – an all-round equine that was capable of taking on a range of functions from farm work to participating in social activities such as hunting and showing. The Dales pony’s only rival in the mid-twentieth century was the little grey Ferguson tractor, but that was sufficient: by the 1950s Dales ponies were in serious decline. Extinction was prevented by the rise of leisure riding from the 1960s onwards. Today the breed is doing better, but is still a vastly underrated northern British achievement that is now mostly kept by a relatively small number of aficionados. A shame; because as well as being hardy and easy to keep, both Fell and Dales are so charismatic and human-focussed, intelligent and versatile, that those who share their lives with them know their value is above rubies. The legacy of the Galloway horse ancestry of both is recognised in the terms “Dales galloway” and “Fell galloway” which are current. In addition, the eye-catching Dales trot is inherited from the famed roadsters and trotters of the 19th century. “There was John Jackson who lived at Sparty Lea, and kept sometimes eight and sometimes ten ponies, and a mule which he called his “his devil” as it was hard to lead; but Jackson being a low, thick, and exceedingly strong man, used to hold the mule by main force while he threw the two bags of ore on to its back. When the weather was fair, Betty, his wife, had to go with him to catch the ponies while he was loading them. I have often seen her riding on the back of those ponies with a man’s weather-beat hat on her head. Jackson was not satisfied with his day’s work with the galloways, but went to pump water in the mines at night; and it has always been a saying that nobody beat the world with hard work in Allendale but Jackson.” B. Irwin, “Notes on Allendale”, 1880. As well as researching and writing about the history of the horse, I am a museum and heritage professional. I also offer editorial services to a select clientele. Recently I’ve been working with talented artist and writer Leena Maria, whose stunning debut novel, “Nephilim Quest: Shadowhunter”, is storming up the young adult charts. Leena is also a fellow WordPress blogger. Check out her site – you’ll find an interview with me there and also her thoughts and comments on the need for the right author-editor alchemy during the creative process.